Joanne in Henderson, Nevada, left a comment the other day, in which she mentioned she might be planting corn in two 2-foot by 8-foot by 12-inch-high raised beds. Corn is one of the vegetables for which spacing makes all the difference. You can scatter tomatoes all around the yard, plant peppers in amongst your roses, and sow your carrots willy-nilly, but not so with corn. Corn is unique in being the only grain we grow with any regularity in the home garden and, as with all grain, corn is wind-pollinated; this has practical consequences. Corn pollen is produced in a tassel at the very top of the plant; these tassels are the "male" parts of the plant. The "female" parts of the plant are the ears formed in the leaf axils along the stalks. From each of these ears extends a cluster of what we call "silk." The far, unseen end of each silk thread is attached to a corn-kernel-in-waiting down inside the ear on what will eventually be the corn cob. What this means is that in order for a grain of corn to form, pollen must travel from the top of the plant, to deep inside the ear, all without any help – and this has to happen for every single kernel of corn. On a perfectly calm and still day, it is possible that pollen might fall straight down from the tassels, land on the silks, and form a kernel. On a day like today, when the wind is blowing like mad, and rose petals are scampering back and forth across my yard like a flock of frightened sheep, there is a good chance that all the pollen will simply blow away – and that is the number one cause of failure when growing home corn. The way we get around that is to always plant corn in blocks rather than in long rows. That way, the blowing pollen will likely blow onto the silks on the next plant over and pollinate the kernels. All of which might be a long-winded way of suggesting, Joanne, that you want to be certain your corn isn't' stretched out in two 8-foot rows, but is rather in more of a block. If your beds are adjacent along the 8-foot sides, consider planting 2 four-foot rows at one end (the same end) of each, for a total of 16 plants, and then using the remaining end of each bed for either a different crop or a later planting of corn. I'll be putting together a new series of vegetable gardening and composting classes in the next few weeks. The classes are always small, to ensure plenty of hands-on instruction, so space is limited. If you're interested in getting information about the classes when the schedule is finished, send me an e-mail to get on the list. 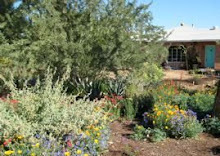 As always, put "Desert Garden" in the subject line, and be sure to let me know if you're more interested in weekday or Saturday classes. I have a potted dwarf Lisbon Lemon that is 3 years old. It finally has bloomed just recently but just doesn't seem joyous. Some of the leaves have a yellowing vein pattern. I imagine it is a deficiency or that I need to repot. Where would you recommend to go for deficiency diagnosis? I want to make my tree as happy as can be! Haven't had much luck with some of the nurseries or blogs. Don't spend your time or money on any kind of testing for soil deficiency. Growing citrus in pots in the Desert Garden does take a little extra care, but not that much. As your lemon is three years old and blooming, you've done a good job so far, and only a couple of adjustments are needed if you want it to really thrive. First, in looking at the picture you sent, it appears that the yellowing leaves are primarily older leaves, from last year or the year before. As with all evergreen plants, the plant as a whole says green year-round, but the individual leaves have a finite life-span. This time of year, it's perfectly normal to see the older leaves on a citrus tree fade, turn yellow, and fall. I'm guessing that's what you're seeing, so there's no cause for concern on that account. But, let's take a broader look at citrus in pots. When they grow in the ground, trees have several natural advantages: they have (in theory) unlimited space in which to spread their roots; they have a natural reserve of moisture in the soil; their roots are kept cool by the lower temperatures underground; and the trees can tap into the naturally occurring soil minerals. These are all essential for the tree's health and growth, and they are all missing in a potted tree. Our job, when we grow a tree in a pot, is to keep these lacking elements in mind, and to compensate for them as much as possible. If you take a look at the picture you sent me, you'll notice that it's a big tree in a little pot; you're right: it's time to re-pot. Your tree needs additional root space to maintain a moisture reserve and cooler roots. Think about a typical 105° Summer day in the Desert Garden; even if the pot is not in direct Sun, over the course of the day the pot and the soil in it will heat up, just by virtue of the surrounding air temperature. The larger the pot, the slower the soil heating , and the larger the moisture reserve. You're not going to want to re-pot a lemon tree every few years, so I recommend getting a large pot, some good soil-based potting soil, and re-potting now. Do your tree a favor and get a pot with straight sides. Tapered pots like the one you have now are not very good for trees in the long run; they have a small soil volume compared to their top diameter, and they also have a tendency to tip over once the tree gets larger. Be certain your new pot has a drainage hole and – here's the exciting part – do not use gravel, sand, old potsherds, or anything else to "improve" the drainage at the bottom. Contrary to popular wisdom, gravel in the bottom of a pot will impede drainage, not improve it. And, last, because your lemon tree will not have much in the way of minerals from its artificial soil, you'll want to fertilize it several times a year with a citrus fertilizer. I recommend using the fertilizer at a rate of about one-quarter the rate recommended on the fertilizer label. Your potted lemon will respond better to several very small and well-spaced doses of fertilizer, rather than one big one, and too much at one time will stress the plant and possibly damage it. Whenever we fertilize, either in a pot or in the ground, always water first, then scratch in the fertilizer, then water again; this should prevent the fertilizer from "burning" the roots. These light fertilizer applications will take care of any mineral deficiencies that are showing up in the leaves. This past Saturday, I spent 7 hours standing at a table on a garden tour, talking about composting. Yes, it's a glamorous life I lead; don't be jealous. Given that we are now at the tail end of citrus season, the question I heard again and again throughout the day was, "Can you put citrus and peels in the compost pile?" Most frequently, it wasn't posed as a question, but rather as a statement in the negative. And, oddly, I heard from any number of people that their son or daughter or husband or wife wouldn't let them put citrus in their compost pile. Not putting citrus in the compost pile must be one of the most entrenched myths about composting in the Desert Garden; everyone knows it's a bad idea. Myth: Citrus peels contain a chemical that keeps them from breaking down in the compost pile, or will cause your compost pile to stop working. Truth: Citrus peels are a great addition to the pile, break down easily and quickly, and contain no chemicals adverse to the composting process. Citrus does contain some strong compounds, but none of them prevent or harm the composting process. Here at The Ranch, I've been composting citrus peels for years and have never had a problem. Myth: Whole citrus cannot be added to the compost pile because they won't break down. Truth: There is a grain of truth to this one, but only a grain. Certain citrus, most notably the Sour or Seville Orange, will not break down if the peel is perfectly intact. My guess is that the oils and acids of the rind prevent the entry of composting micro-organisms. If, however, the peel has even the slightest cut or scrape, or opening, the fruit will compost quickly and completely. When adding whole citrus to your compost pile, simply take a half a second and make certain the rind is cut. Or, just take a jab at them with your spading fork whenever you turn the pile; it's good practice for hand/eye coordination. Myth: Citrus will make your compost acidic, and that's a bad thing. Truth: To the contrary, it's a good thing. Our soils here in the Desert Garden are highly alkaline, so slightly acidic compost will be beneficial. While our native and adapted desert plants do fine in our naturally alkaline soils, the vegetables and flowers that we grow in compost-amended soils prefer a soil pH of around 7 to slightly below, so if our compost ends up acidic, so much the better. Myth: OK, fine, some citrus is acceptable, but you have to be sure not to add too much. Truth: You can't add too much citrus to your compost pile, but you can add too much in proportion to other ingredients. But that's true of anything. I did have one woman tell me that she filled her compost bin to the top with citrus and citrus peels and it didn't make compost. When I asked what else was in the bin, she said, "Nothing, just the citrus." And therein lay the problem. Citrus is considered a "green" or nitrogen-bearing material. The basic recipe for compost has four necessary ingredients: carbon, nitrogen, water, and air. Absent any of the four, the process won't work. A bin full of nothing but citrus won't produce compost any better than a bin full of nothing but grass or lettuce leaves; that it's citrus is irrelevant. So go ahead and add as much citrus as you want, but be certain to add an equal amount of carbon-bearing material at the same time. Myth: My husband, wife, son, or daughter won't let me put citrus in my compost pile. Truth: In every life there comes a moment when we are called to stand strong in defense of truth, integrity, values, and honesty, no matter who may be challenging our principles or tempting us to infidelity. This is not that moment. But just for practice tell 'em to buzz off and get their own darn pile. I have recently received several e-mails and comments about fruit flies in the compost pile, and have had several clients asking about the same issue. Fruit flies can certainly crop up in the compost pile, and you can look here at a previous post for some tips on controlling them, but more often than not the issue is not fruit flies, but a little critter called the Fungus Gnat. I wish they had a different name, because there is something about "Fungus Gnat" that seems to cause immediate panic and loathing in those who hear it for the first time: clients generally repeat "Fungus gnats!" in a tone of voice that I think more properly reserved for discovering that one's compost pile is infested with, say, zombies, or crocodiles, or possibly flesh-eating bacteria. Butterflies, which cause far more garden damage than ever dreamed of by the lowly fungus gnat, are met with coos and smiles and calls to the children to "come see the pretty butterfly," while the announcement of fungus gnats is invariably greeted with, "how do I annihilate them and all their descendants unto the seventh generation?" Fungus gnats are slimmer than fruit flies, very small with black bodies and tiny, generally silvery wings. In the compost pile, you'll often see them clustering on the surface of the pile, and sometimes running on the container surfaces. They are attracted to moisture and rotting material, which explains their presence in the compost pile. They cause no damage to the compost, or to humans, and are strictly a nuisance rather than a problem. As with most insect problems in the compost pile, the truly effective solution is to turn the pile frequently. You could eliminate them from your compost by letting the pile dry out, or by spraying toxic chemicals, but neither of these comports with the successful production of useful compost. Frequent turning will somewhat disrupt their life cycle, and just generally make life a bit rough on them. I have been told that the use of coffee grounds in the compost pile will greatly reduce or eliminate the presence of fungus gnats, but I know of no scientific literature that verifies the claim. On the other hand, coffee grounds are great for compost, I use lots of them, and I rarely have much of an issue with fungus gnats, so there may be something to it. So, if you have fungus gnats, turn the pile frequently, don't even think about spraying anything, try using coffee grounds, and be thankful you don't have zombies. I noticed on the Maricopa vegetable calendar that melons should be planted in March from seed. Since I've never grown them before, I'm wondering what conditions they need: lots of water; mulched soil; partial shade or direct sun; protection from bunnies? Kristen, I'm glad you asked. I haven't grown melons in a couple of years, and this year I'm making up for lost time. Here at The Ranch, this will be, you might say, the Year of the Melon. In the Desert Garden, Cantaloupe and Muskmelons can be planted from seed now through the end of July; watermelons from now until mid-April. All melons need plentiful Sun, so they are star perfomers in the desert, and with a little care the Summer extremes won't faze them. Prepare a seed bed of deep rich soil; that's another way of saying dig in plenty of compost or manure. If you use manure, be sure to wait a week or so before planting. Shape the bed as a basin, pulling soil to the side to provide a wide sunken area. In that sunken area is where you'll plant your seeds. The "walls" that you form by pulling the soil to the edges will allow you to flood the planting area, providing the deep and even water that melons need. Be certain to use some netting to protect the sprouting seeds from avian predation, and once the plants are up and growing, use a thick layer of an organic mulch to cut down on evaporation and to help maintain even water levels. If you have a rabbit problem, do fence the area to forestall damage. Melons of all types tend to sprawl and take up valuable acreage in the garden. My favorite method for getting around this is to use trellises. Use a sturdy trellis, anchor it over the planting area, and then guide the growing vines up and onto it. As the melons begin to form, they'll be heavy and will pull the vines off the trellis, so make cloth slings – old t-shirts or used (but clean) diapers work perfectly – to cradle each fruit, tying the sling to the trellis; this is why we use a sturdy trellis. Not only will trellised melons take up less space, but they also lead to less insect damage and will protect the fruit from the rot that can result from soil contact. As you might imagine, the smaller melon varieties are a bit better for this method. As the weather heats up, you will notice that your melon leaves will wilt and fold in the mid-day sun. Don't panic. Check under your mulch: if the soil is still moist and you've been watering deeply, don't water yet; if the soil is dry, water right away. The wilting leaves help the melon cope with the hot Sun and over-watering in response can lead to root rots and failed plants. As the plants get near to harvest time, back off the water slightly; over-watering in the last week will result in poor flavor. What if I'm composting in a bin with no doors at the bottom? Is there anything I can do to keep the compost looking good? Can I get good quality compost by just leaving it in the bin for about a year? While you might eventually get some usable material from a static (unturned) pile, the odds are against it. Because the Desert Garden is so dry for much of the year, it's difficult to maintain a static pile that has the conditions necessary for the breakdown of the organic material into usable compost. If you don't turn and don't water, then you eventually get a pile full of dried-out plant material. If you do water, but don't turn, much of the water will flow to the bottom of the pile and you will end up with dried plants on top, and anaerobically decayed plant material on the bottom (think black smelly slime). The doors at the bottom of some commercially made composters are useful only for turning over the pile. Contrary to the advertising, we really can't just put stuff in the top and then take it out the bottom doors as compost – at least not here in the desert. So, if you don't have little doors, don't worry: you're not missing out. What you will need is a way to turn the pile. If your compost bin is small and light, then simply lift the bin off the pile, set it to one side, then turn the compost into the bin using a spading fork; this is the easiest method. If you can't lift the bin itself, then use your spading fork to turn the compost within the pile, or to turn it from one bin to another; a double- or triple-bin system is really the easiest way to manage your pile once you really get going with composting. At the end of the day, the key to composting in the Desert Garden is to remember the four necessary ingredients of composting: carbon, nitrogen, water, and air. If what you're doing doesn't get these four ingredients to all parts of the pile at all times, then it won't work.